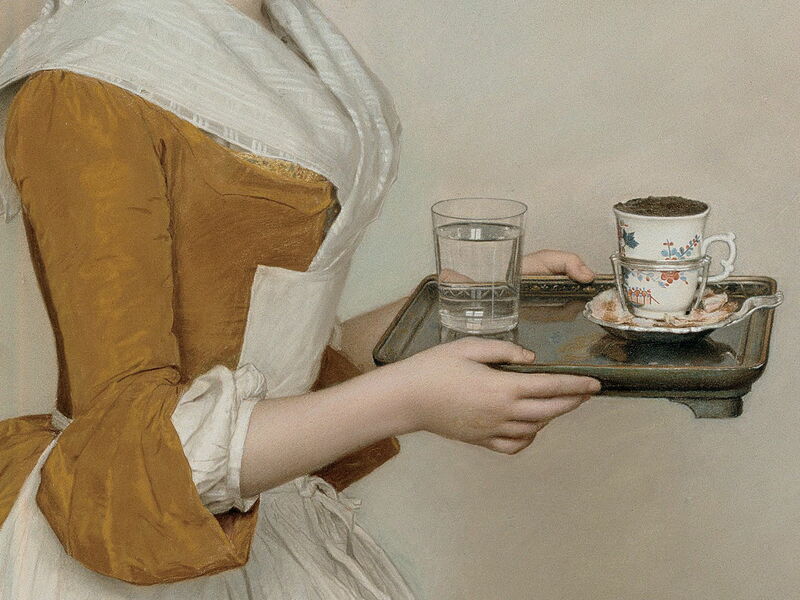 Jean-Etienne Liotard (1702-1789), The Chocolate Girl (detail) (c 1744-45), pastel on parchment, 82.5 x 52.5 cm, Gemäldegalerie Alte Meister, Staatliche Kunstsammlungen Dresden, Dresden, Germany. Wikimedia Commons. Edgar Degas and Mary Cassatt were highly-accomplished painters in (soft) pastels, who were remarkably innovative in their techniques and styles. To help put their pastel paintings into historical context, this article and the next look very briefly at the history of the medium, and some of its greatest exponents. It is important first to draw distinction between pastels and other earth and chalk media. From the very earliest art in caves, humans have applied powdered earths and chalks to surfaces in their visual art. Some of the oldest surviving masterpieces which were made using coloured chalks include those of Leonardo da Vinci (1452–1519), which are sometimes referred to as using pastels. Leonardo da Vinci (1452–1519), Isabella d’Este (1500), black and red chalk, yellow pastel chalk on paper, 63 x 46 cm, Musée du Louvre, Paris. Wikimedia Commons. 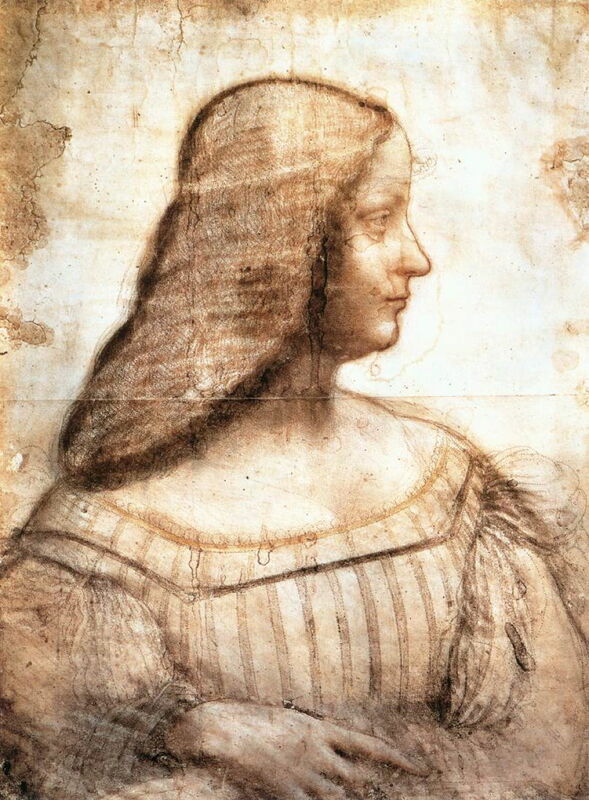 An example is this drawing of Isabella d’Este from 1500, described here as using “black and red chalk, yellow pastel chalk on paper”. But there is no such thing as “pastel chalk”, any more than there is “oil watercolour”. Pastels are much more than just a stick of pigmented chalk or coloured earth. They are made by mixing pigment, a bulking powder, and water containing a gum or glue, into a thick dough-like paste. The paste is then formed into sticks, which are dried slowly to produce a stick which is sufficiently firm as to be capable of being sharpened and applied to paper or other ground. Painting in pastels requires a substantial number of sticks of different colours; although those of different colour can be blended on the paper or ground, pastels do not mix like oil paints to produce good intermediate colours. You cannot paint properly in pastels with just half a dozen different colours, but need dozens or hundreds to support a broad spectrum of colour. Windsor & Newton Soft Pastels, boxed set of 200. Image by EHN & DIJ Oakley. 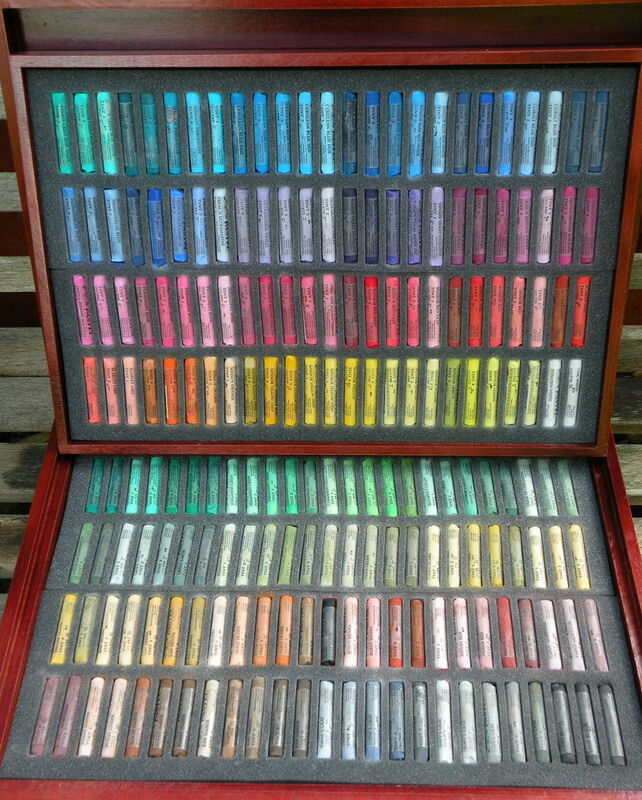 This shows one of my sets of pastels, now sadly unavailable, a Windsor & Newton boxed set of 200. A serious pastel painter is likely to have hundreds of different colours and shades stored in a chest of shallow drawers, for example. Robert Nanteuil (1623-1678), Portrait of Monseigneur Louis Doni d’Attichy, Bishop of Riez (1663), pastel on paper, 34.3 x 27.9 cm, J. Paul Getty Museum, Los Angeles, CA. Wikimedia Commons. 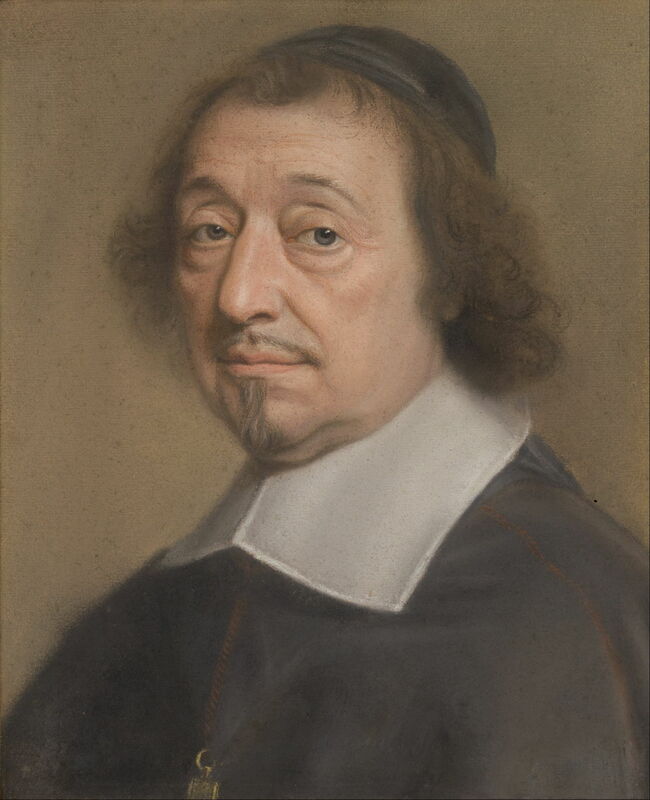 Nanteuil’s Portrait of Monseigneur Louis Doni d’Attichy, Bishop of Riez from 1663 is one of the first real pastel paintings, in creating a good likeness of his sitter. It is relatively small, but expertly worked. It wasn’t until the eighteenth century that pastel portraits became popular, but they quickly became all the rage. Unlike oil paints, which were conventionally applied in layers and resulted in protracted periods for the production of a portrait, pastels adhere to the ground mechanically, and have no drying time. A good pastellist could produce a fine portrait in a very few sittings, making pastel portraits far less demanding on both parties, much quicker, and of course much cheaper. 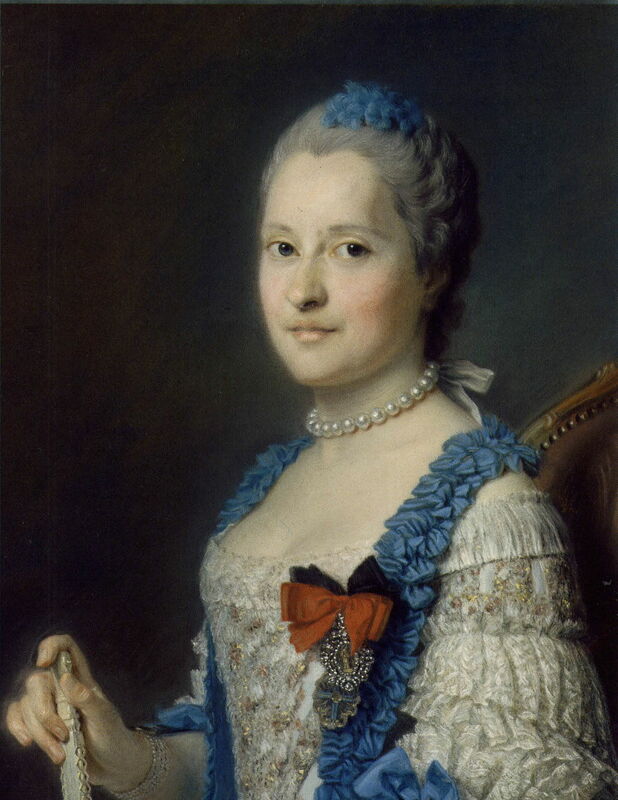 The ‘look’ of pastel paintings also came into vogue. Flesh looked amazingly lifelike, and in the absence of drying oils and varnish, had a soft, matte finish. The snag, at first, was that there were no fixatives to help the adhesion of pastel to ground, all had to be glazed, and even then they did not prove as long-lasting as a well-made oil painting. But at that price, only the very rich would care. 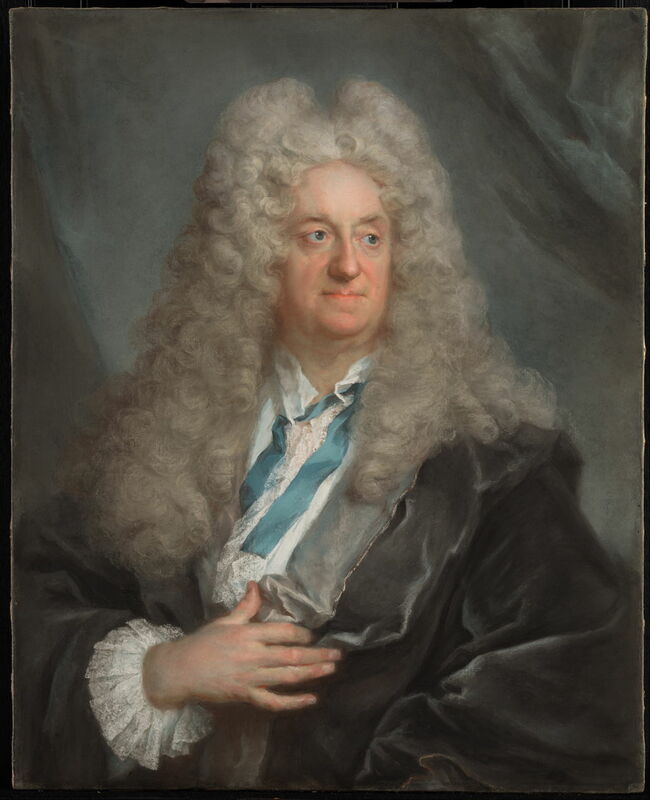 Joseph Vivien (1657–1734), Portrait of a Man (c 1725), pastel on blue paper, 91.4 x 66 cm, J. Paul Getty Museum, Los Angeles, CA. Wikimedia Commons. Joseph Vivien (1657–1734) was one of the first successful pastel portraitists of the eighteenth century, producing superb works such as this portrait of an unknown man from about 1725. For this, he used other innovations, laying his pastels down on blue paper, and working in large format, here 90 x 66 cm. Charles Antoine Coypel (1694-1752), Medea (c 1715), pastel, 29.4 x 20.6 cm, The Metropolitan Museum of Art, New York, NY. Wikimedia Commons. 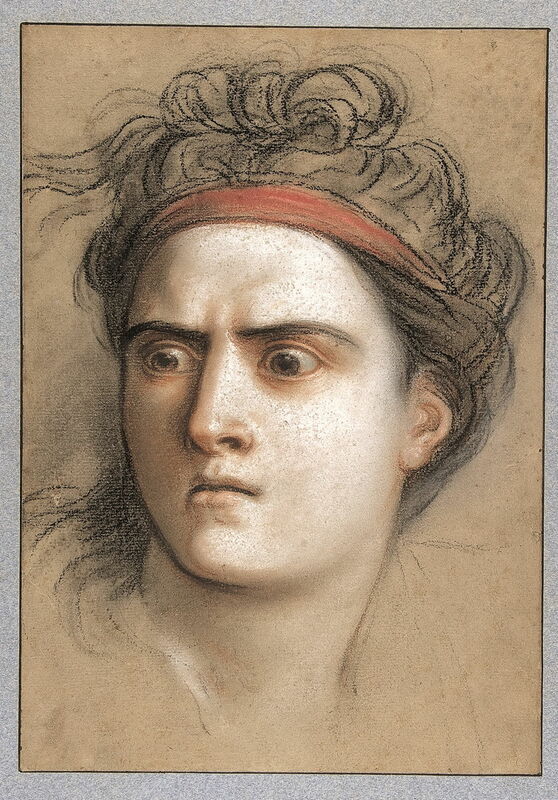 Mainstream artists started using pastels in preparatory work and sketches, here Charles Antoine Coypel’s dramatic portrait of Medea (c 1715). One of the most brilliant of this first big wave of pastellists was Rosalba Carriera (1675–1757), whose work demonstrated that a good pastel painter could match the accomplishments of the best oil painters of the day. 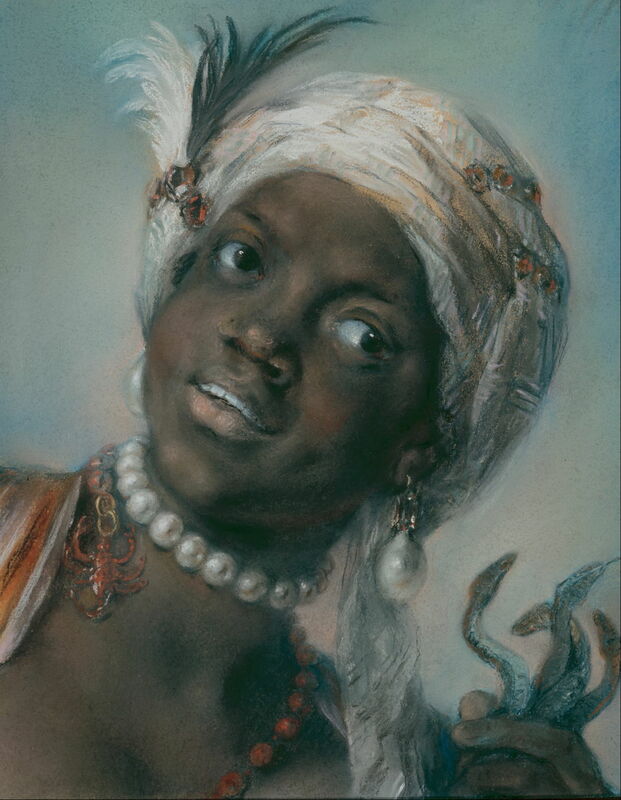 Rosalba Carriera (1675–1757), Africa (date not known), pastel on paper, 34 x 28 cm, Gemäldegalerie Alte Meister, Staatliche Kunstsammlungen Dresden, Dresden, Germany. Wikimedia Commons. Carriera also had quite a painterly style at times, as shown in her rich marks in Africa, for which I regret that I don’t have a date. In a future article I will attempt to describe her work more systematically, but these few examples should give a good idea as to her brilliance. Rosalba Carriera (1675–1757), Self-Portrait as ‘Winter’ (1730-31), pastel on paper, 46.5 x 34 cm, Gemäldegalerie Alte Meister, Staatliche Kunstsammlungen Dresden, Dresden, Germany. Wikimedia Commons. In the fingers of a skilled pastellist, materials which had long challenged painters in oils, like hair and fur, became great strengths. Carriera’s superb Self-Portrait as ‘Winter’ from 1730-31 is a fine example. Rosalba Carriera (1675–1757), Self-Portrait as ‘Winter’ (detail) (1730-31), pastel on paper, 46.5 x 34 cm, Gemäldegalerie Alte Meister, Staatliche Kunstsammlungen Dresden, Dresden, Germany. Wikimedia Commons. Look carefully here and you can see the individual grains of pastel which form each mark Carriera made. 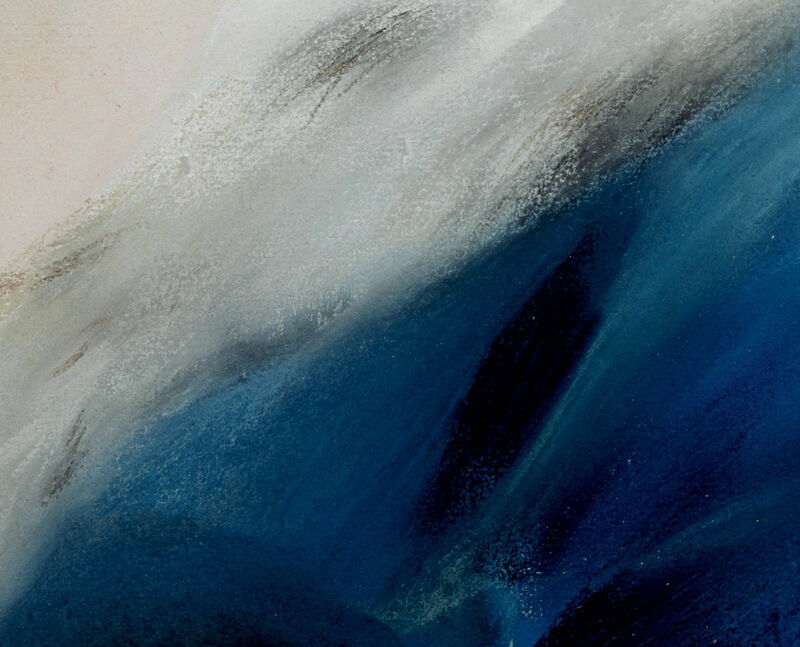 She did not just apply her pastels dry and from the stick, but in places made them into a paste using water, and applied that to the paper using a brush. Rosalba Carriera (1675–1757), Crown Prince Friedrich Christian of Saxony (1722-1763) (1739-40), pastel on paper, 63.5 x 51.5 cm, Gemäldegalerie Alte Meister, Staatliche Kunstsammlungen Dresden, Dresden, Germany. Wikimedia Commons. 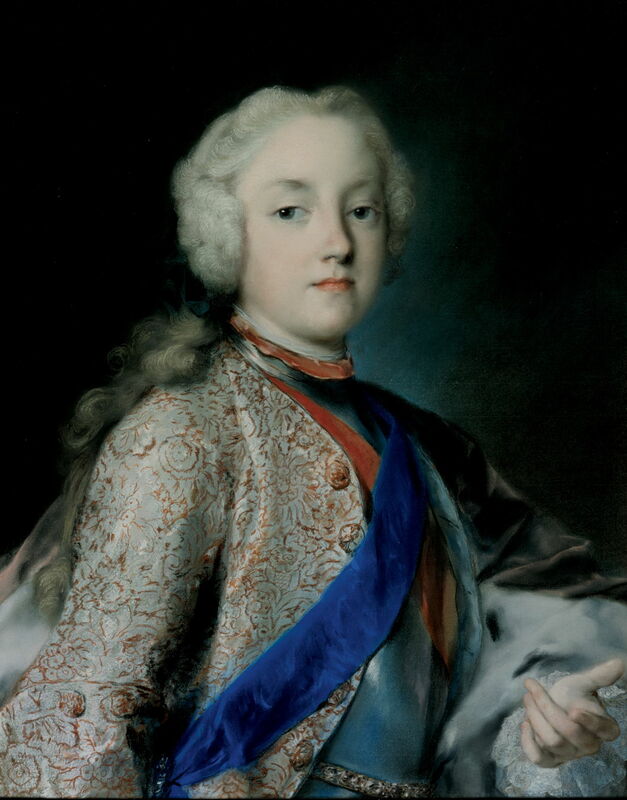 Carriera’s supreme skill with pastels brought even royalty round to have their portraits painted in the new medium: here Crown Prince Friedrich Christian of Saxony (1722-1763), whom she painted in 1739-40. Pastels were quickly deemed an acceptable medium for women painters too, who did not then have to contend with the mess and fuss of oil paints, solvents, and cleaning. And most important of all, their hands and clothes were not stained with paint. Pastels are dusty, and these days there are sufficient concerns about the inhalation of toxic pigments in pastel dust as to bring some artists to work in protective masks. Although the eighteenth century was long before the rise of modern health and safety, the first medical interest was being shown in occupational diseases, and it was already known that those working with lead – including workers preparing lead pigments for oil paint – needed particular care and protection. The star pastellist of the middle of the century was undoubtedly Maurice Quentin de La Tour (1704–1788), whose works are readily seen in the Louvre and elsewhere. 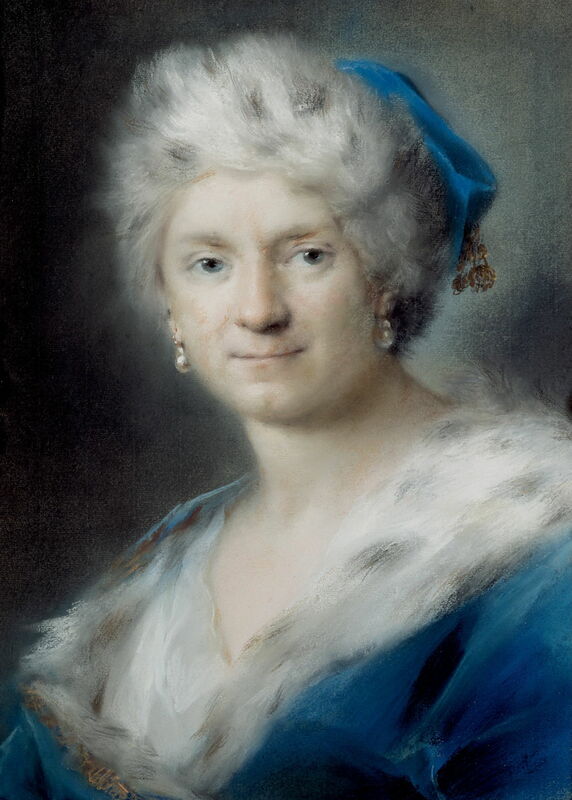 Maurice Quentin de La Tour (1704–1788), Portrait of Marie-Josèphe of Saxony, Dauphine of France (1731–1767) (1756-60), pastel on paper, 64 x 52 cm, Musée du Louvre, Paris. Wikimedia Commons. de La Tour not only excelled at modelling the softer surfaces and materials which pastels were so suited to, but tackled the harder and glittery materials used in jewellery and the like. They are particularly well shown in his Portrait of Marie-Josèphe of Saxony, Dauphine of France (1731–1767) (1756-60). Maurice Quentin de La Tour (1704–1788), La Marquise de Pompadour (c 1749-55), pastel on seven sheets of blue paper mounted on canvas, 213 x 178 cm, Musée du Louvre, Paris. Wikimedia Commons. Another of his famous paintings which is in the Louvre now is this magnificent portrait of La Marquise de Pompadour (c 1749-55). 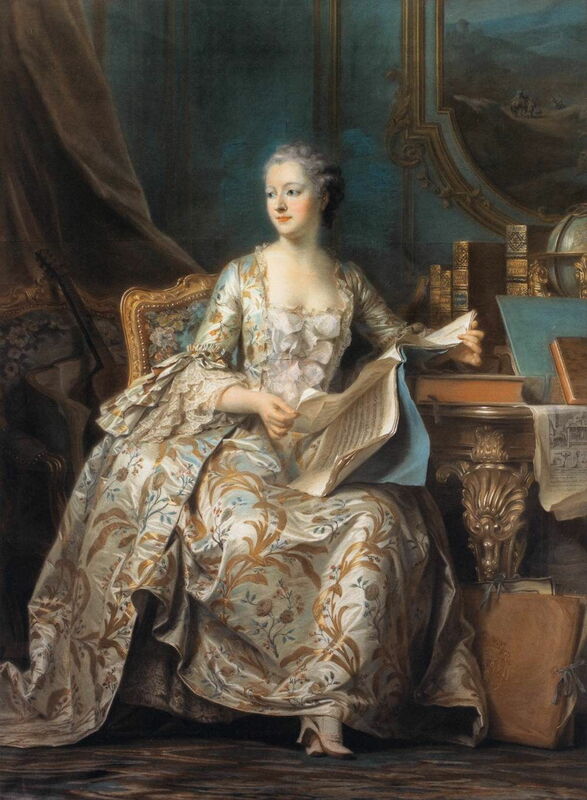 Maurice Quentin de La Tour (1704–1788), La Marquise de Pompadour (detail) (c 1749-55), pastel on seven sheets of blue paper mounted on canvas, 213 x 178 cm, Musée du Louvre, Paris. Image by EHN & DIJ Oakley. 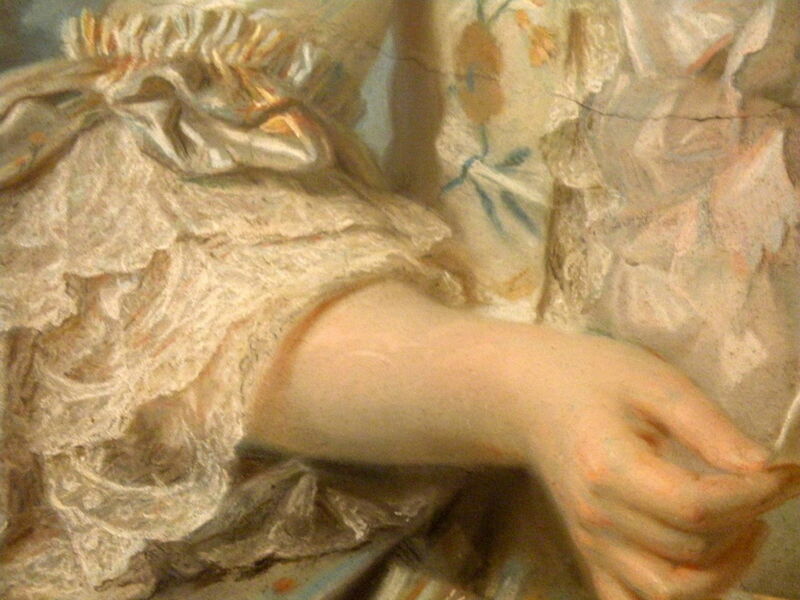 As with Carriera’s pastels, it is worth getting a close look at de La Tour’s work: this detail of La Marquise de Pompadour reveals how gestural his marks are in most of the detail, and his famously soft-focus flesh. 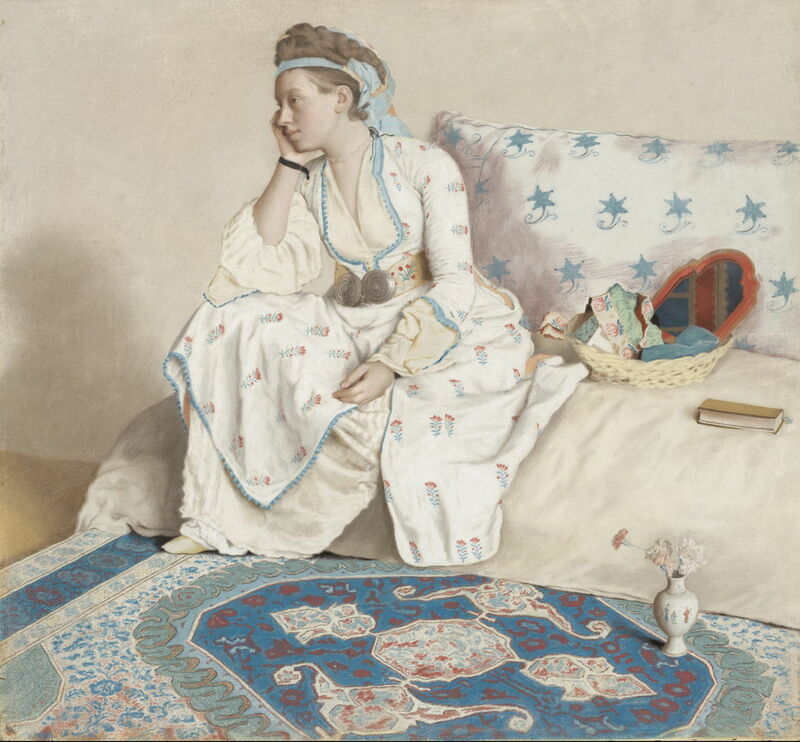 After de La Tour, the next brilliant pastellist was quite a contrast: Jean-Etienne Liotard (1702-1789), whose meticulous realism is just breaktaking. 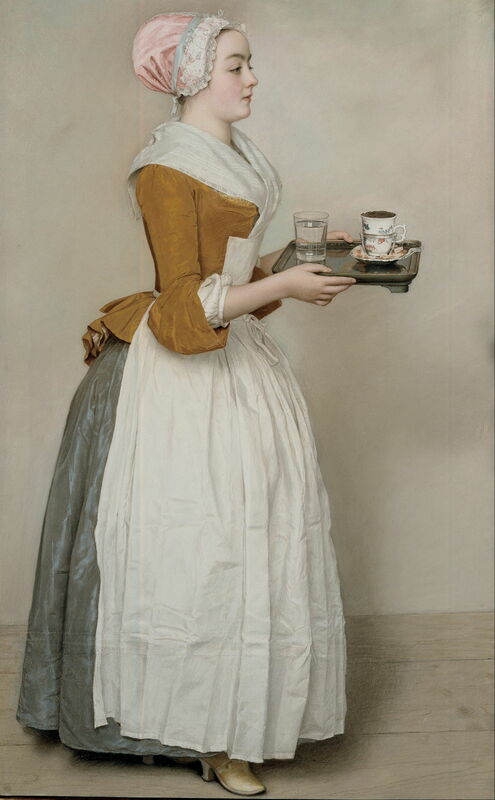 Jean-Etienne Liotard (1702-1789), The Chocolate Girl (c 1744-45), pastel on parchment, 82.5 x 52.5 cm, Gemäldegalerie Alte Meister, Staatliche Kunstsammlungen Dresden, Dresden, Germany. Wikimedia Commons. Applying his pastels to parchment rather than paper, he was able to paint painstakingly detailed realist works like The Chocolate Girl (c 1744-45). This shows how the medium was starting to move on from regular portraits, here to what is perhaps best termed genre. Only when you see the patterned grain of the pastel on parchment does it become clear that this is not oil paint. I still marvel at the glass of water: surely a demonstration tour de force to make the viewer gasp in wonder. Jean-Étienne Liotard (1702–1789), Portrait of the artist’s wife, Marie Fargues (c 1718-1784), in Turkish dress (1756-58), pastel on parchment, 103.8 × 79.8 cm, Rijksmuseum Amsterdam, Amsterdam, The Netherlands. Wikimedia Commons. Liotard had moved in the opposite direction to Carriera and de La Tour: instead of emphasising mark-making, he concentrated on creating uniformly detailed, smooth, and light works, such as his Portrait of the artist’s wife, Marie Fargues (c 1718-1784), in Turkish dress (1756-58), a large work on parchment. Thea Burns (2007) The Invention of Pastel Painting, Archetype. ISBN 978 1 904982 12 3. Posted in General, Painting, Technology and tagged art history, Carriera, Coypel, da Vinci, de la Tour, Liotard, Nanteuil, painting, pastel, Vivien, women in art. Bookmark the permalink.